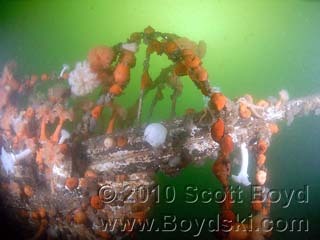 All my favorite sunken boats require scuba gear to go see. Know that's not what you meant, but then I usually catch dinner when I go see my favorites, how about you. This one is in Antarctica. The picture gives me the willies. While sea kayaking around Cape Caution on the coast of British Columbia we came across the battered remains of a barge that must have broken free or been cut loose during a storm. Only about 1/4 of it remained and all of it was in the trees, well above and back from the high tide line. It was mind blowing to consider how violent the sea state must have been to break up the barge and to lift and push so much mass that height and distance. I spent a lot of time over the past years searching for wrecks in the Pacific Northwest. 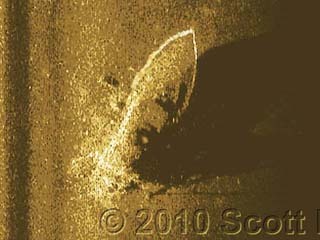 One of my favorites was locating Harold Stephens very famous Schooner the Third Sea. 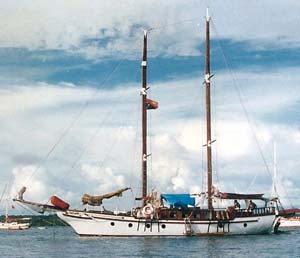 It is a 71' concrete hulled sailboat that was the subject of his book "The Last Voyage, the Story of Schooner Third Sea". 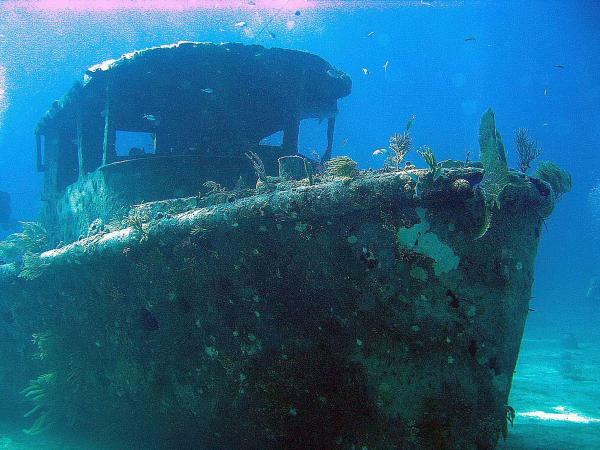 This is an old shrimp boat that sank during a storm in 1968 off Grand Bahama Island while carrying mercenaries in an attempt to overthrow Francois “Papa Doc” Duvalier in Haiti. Ammunition clips were still being found among the coral heads as recently as ten years ago. 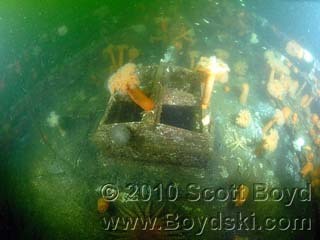 Jaws "Orca", grounded and rotting in Menemsha Pond 2007. Probably gone my now. And this qualifies as well. The "Bounty" coming up West Passage, Narragansett last July. Not really a favorite subject but these pics are kinda interesting. From a while back and some of the forum members have seen these before. Up and out she comes ! 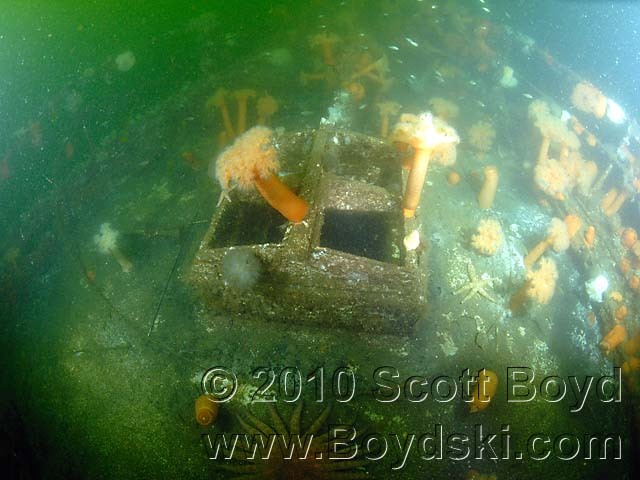 HMCS Columbia, scuttled off of Maude island BC (near Seymour Narrows) in 1996 for use as an artificial reef for divers. 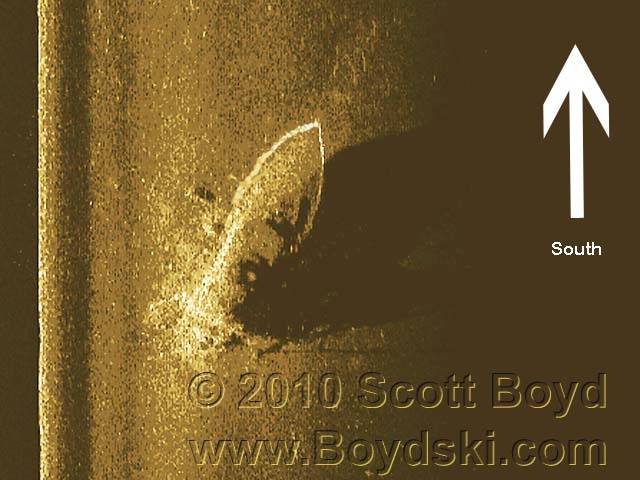 Image from a Simrad Structurescan. 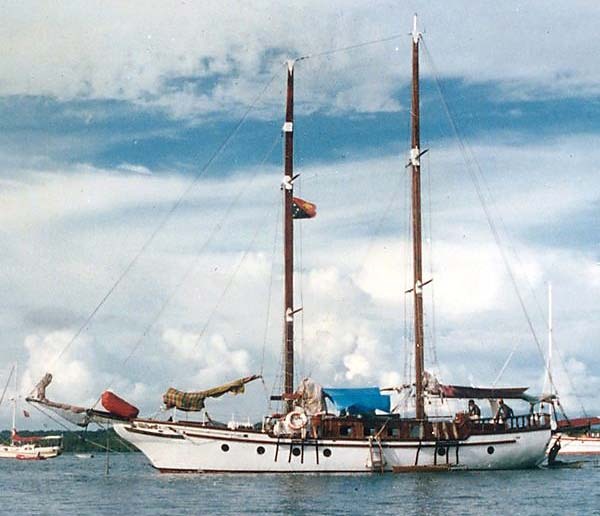 The Ning Po, a huge Chinese junk built in the 1750's, now sitting on the bottom of Catalina Harbor, with just her ribs sticking up out of the water at low tide. 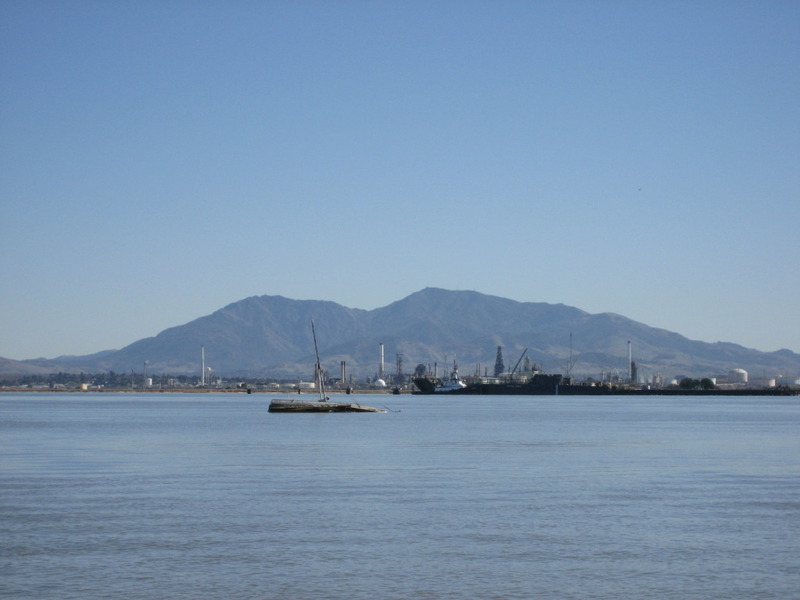 She took part in a rebellion against the emperor, (crew of 60 beheaded), piracy and slavery. The museum in Avalon has artifacts from the vessel, including a beheading sword. Don't know what kind of wood they used to have lasted so long, but I'm guessing teak. The one that I owe way more money on than it is worth!!!!! Sunken boats, Baker. Not boats under water. Willies, yes, but I LOVE that picture. My daughter, on the other hand, has decided that she would rather not take our boat-- whatever boat that may end up being-- to Antarctica. I'd agree with your daughter on that call. 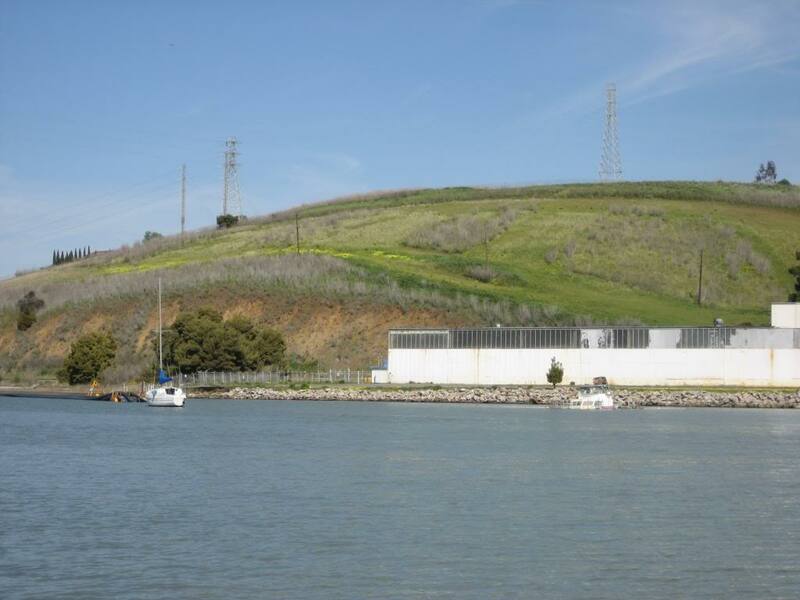 That place is so isolated and foreboding, then the sunken boat just makes it worse.